Sam writes: Any tricks or suggestions for grilled jerk chicken? 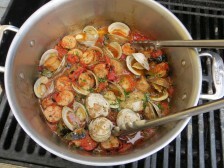 I’d like to make a batch next weekend for a cook-out. Tony’s take: Hey, Sam. Thanks for the question! As I write (and eat) the recipe below, I feel moved (no, make that, obligated) to share a new revelation (or, at least, something I had forgotten): grilled jerk chicken (crisp, spiced, smoky) out-skins all other poultry players (the flavor-soaked coating of buffalo wings, the buttery crackle of a perfectly roast bird, and, yes, even the glazed exterior of a Chinese roast duck). I know – none of this pertains to your actual question, but for the skin alone, I would make jerk chicken. Now that my moment of sharing is out of the way, I do have ideas for jerk. They’re not particularly authentic (I’ve spent all of 1 week in Jamaica – I was young and my focus was on waterfalls, swimsuits, and curried meat pies), but I have made a bunch of different versions over the years and this is an amalgam of my favorites. 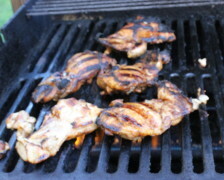 Most of my jerk tricks, not surprisingly, center around the marinade. 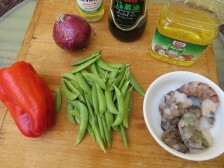 And grilling easy – so that the skin crisps and browns without burning. Irie, irie. 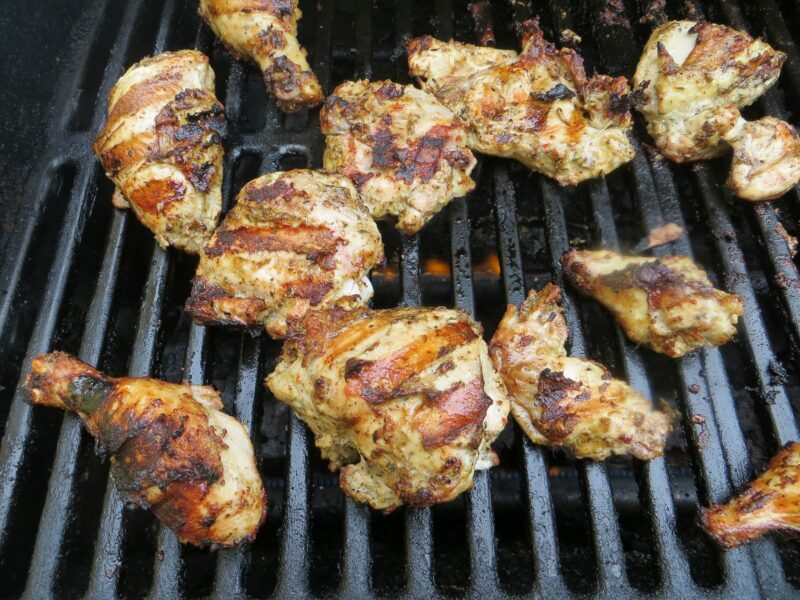 -Mustard makes the marinade: It may not be traditional, but mustard smooths out the intensity of jerk’s assertive flavorings (fresh ginger, Scotch Bonnet pepper, garlic, fresh thyme, and allspice), concentrating their punch. Use whole-grain mustard; the seeds add flavor without getting in the way, as regular Dijon might. 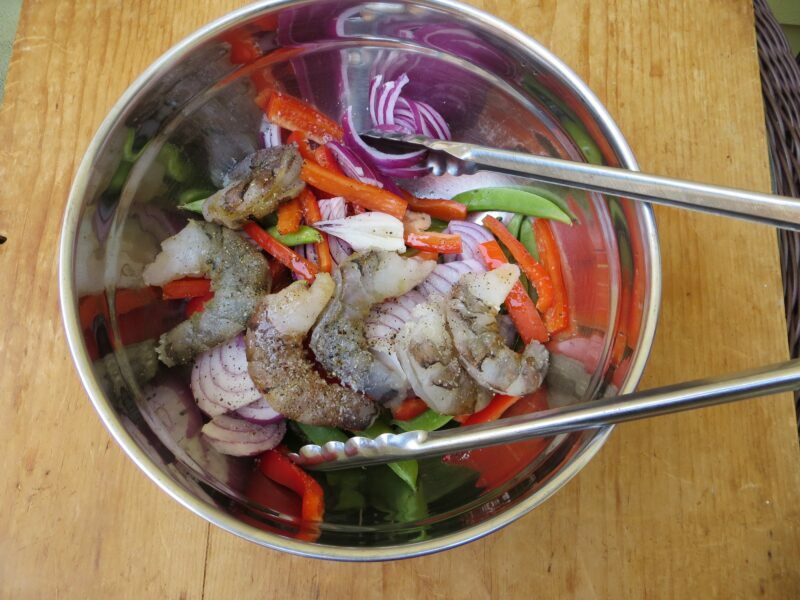 –Prep ahead: A good marinade is as much about the time you allow it to do its thing as the actual flavorings. Two days of marinating is optimum. 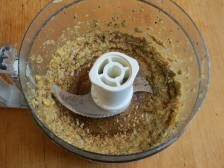 And use a food processor (or mortar and pestle if you’re so inclined); it purees the ginger and garlic into a smooth paste. 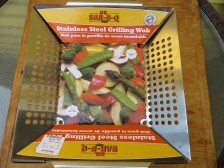 – A bed of vegetables…: Another revelation for me: wilting grilled vegetables with grilled meat. 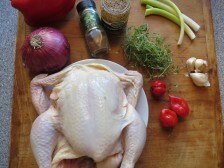 It’s a common thing with roasting: roast a whole chicken over a layer of vegetables so the two mix and meld. But setting the grilled chicken pieces (just as they come off the fire) on top of the vegetables for a couple of minutes before serving, allows all of their wonderful juices to soak into the veggies. It’s a small thing, but nice. 1. Cut up the chicken: Cut up a whole chicken (about 4 lb) into 10 pieces (check out this video or this photo step-by-step, both from Fine Cooking and really well done). 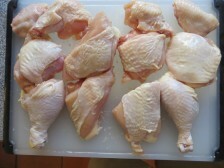 Rinse the chicken pieces under cold running water and then pat dry with paper towel. 2. 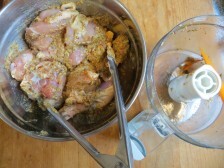 Make the marinade: In a food processor or mini-chop, mix 1/4 cup whole-grain mustard, 1/4 cup olive oil, 2 Tbs. minced ginger, 1 Scotch bonnet pepper or habanero (chopped; leaves the seeds in if you’re feeling crazy), 2 tsp. chopped fresh thyme, 1 shallot (chopped), 2 minced cloves garlic (about 2 tsp. 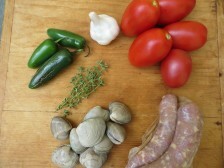 ), and 1/2 tsp. allspice. Sprinkle the chicken first with 2 tsp. kosher salt and 1 tsp. black pepper and then coat with this spice paste. Marinate for 1 hour at room temp or up to 2 days in the fridge for best results. 3. Grill the chicken: Prepare a two-zone fire on a gas or charcoal grill with a medium-high and a low area. Set the chicken skin side down over the hot zone and grill until the skin browns but doesn’t burn, about 5 minutes. Flip, transfer to the cooler zone, cover the grill (with the vents open if you’re working with charcoal), and cook until the chicken browns all over and cooks through, 15 to 20 more minutes (slice into a thicker part of the thigh or check that it hits 165F on an instant read thermometer); the chicken should cruise along just fine over a low fire, but check often and lower the heat or nudge the bird to a cooler zone if it starts to burn. While you’re grilling the chicken, grill some red pepper, zucchini, and red onion. 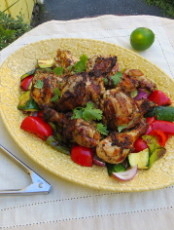 Set the grilled chicken on top of the grilled vegetables on a platter and serve, sprinkled with fresh cilantro and lime juice. Beth writes: We’re having a small dinner party next weekend for my husband’s work friends (2 couples plus us). I’d like to plan a really simple grilled menu. Steaks for the main course (my husband’s choice! ); the easier the better. None of us is a gourmet! Tony’s take: Thanks for writing, Beth! 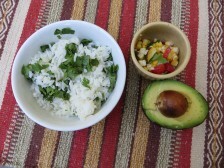 The casual, summer meal you’re describing is my kind of thing. 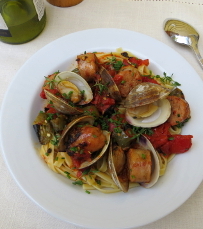 If you push the menu in an Italian direction (which I would), you can create a meal that’s both simple and sophisticated… in an understated, I-just-got-back-from-Florence kind of way. Steak gets passed over for entertaining duty too often; and, instead, wedged into family-only/burger-and-dog territory. A good cut (like a strip steak, rib eye, or flank) can serve as the perfect centerpiece for company. Season the meat well, grill until it’s a perfect medium-rare, and then pair with a couple of summery Mediterranean “salads”. 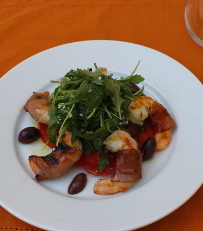 Neither of the pairings I suggest – the light arugula salad (generously dressed with good olive oil and red wine vinegar) nor the stacks of fresh tomato and mozzarella – are sauces in the traditional sense. But they make perfect summery counterpoints to the grilled beef: the peppery arugula offers a sharp balance, while a sprinkling of herbs marinates the meaty slices of tomatoes and mozzarella, enhancing the fruit’s brothy juices. 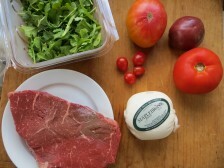 A drizzle of good olive oil pulls the trio (steak, arugula, and tomatoes) together and makes the meal, more method than actual recipe, one that will impress. The steak: Following the old “chicken salad from chicken bleep” saw, the most important element to a great grilled steak is great steak. There are merits to all sorts of cuts, though I prefer chewy, beefy steaks as opposed to delicate (and expensive) ones like tenderloin or rib-eye. By my count, flank offers the best balance of flavor and affordability (though it’s not all that affordable anymore). 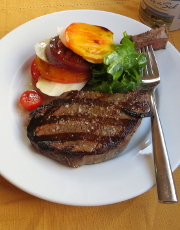 If money is no object, I’ll go with a strip steak (rich beefy flavor, slight chew), while top sirloin (which I used here), tender and decently flavored, is my favored bargain. The grill: There are only 2 real tricks that I employ when grilling steaks. 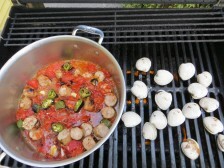 The first is to let the meat sit at room temperature while the grill heats. This 20 minute period allows the steaks to lose some of their chill, which helps them cook more quickly and uniformly (so the inside hits medium rare before the outside develops a gray ring). My other steak strategy is to build a moderate fire, hot enough to give the steak nice grill marks, but not so hot that the exterior chars before the interior comes to temp. 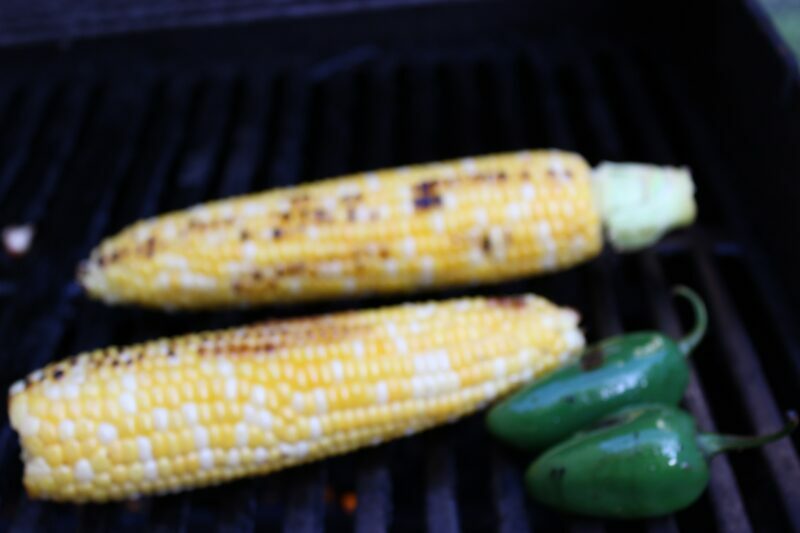 Most great grill flame-outs come as a result of a zealous hand with the lighter fluid or charcoal (or both). Be easy! 1. Get prepped: Prepare a medium-high fire on your charcoal or gas grill. Set 3 lb. 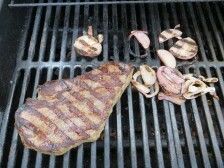 steak (like 2 medium flank) on a large platter and hold at room temp for 20 to 30 min while the grill heats. 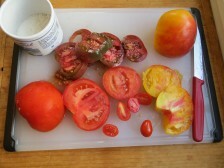 Thinly slice 3 large tomatoes (about 1 1/2 lb) and set on another large platter. Sprinkle generously with 2 tsp. chopped fresh thyme and 1 1/2 tsp. kosher salt and let sit for at least 5 min and up to 1/2 hr. 2. Grill the steak: Sprinkle the steak generously with kosher salt (about 1 tsp./lb or a total of 1 Tbs. for 3 lb. steak) and black pepper. Brush the grill grates well and lightly oil with a wad of paper towel. Set the steak on the grill and cook without touching until it starts to brown around the edges and easily releases when you lift a corner, 3 to 4 min. Flip and continue cooking until the steak is done to your liking, another 3 min or so for medium rare. To check doneness, make a nick into a thicker part of the steak or use an internal read thermometer (the steak should hit 13oF for medium rare). Note: As you can see from the pic below, I also tossed slices of red onion on the grill, drizzled them with balsamic and set alongside the steak. 3. Assemble and serve: Transfer the steak to a carving board to rest for 5 min. Toss a 5-oz. pack of baby arugula with 4 Tbs. olive oil, 2 Tbs. red wine vinegar and a sprinkling of salt (about 1/2 tsp.). Alternating between slices of the marinated tomato and 12 oz. fresh mozzarella (thinly sliced), layer the tomato and mozzarella and set in stacks on 6 dinner plates. Set a mound of the arugula next to it. 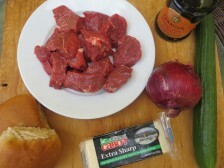 Thinly slice the steak and add to the plates as well. 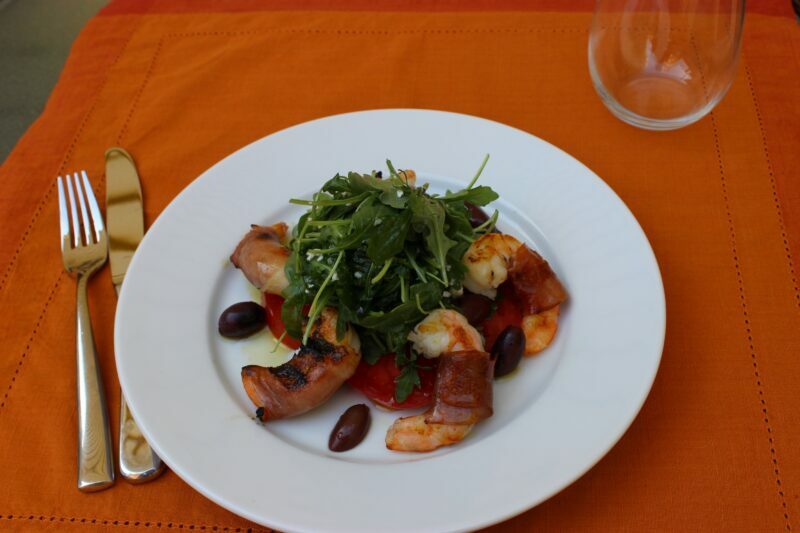 Drizzle with the best olive oil you’ve got and serve. 1. Buy chuck: Whether you’re grinding or buying pre-ground, look for cuts from the chuck (ie: the shoulder). It’s just the most flavorful part of the animal; tough, well exercised muscles that grind nicely. Round is too lean (and can taste livery). 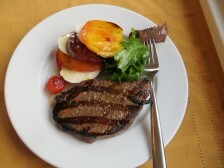 Sirloin sounds good, but has muted flavor. Fatty cuts like brisket or short rib are in vogue, but can be problematic on the grill (flare-ups). If you’re buying pre-ground, go with 85% lean; enough fat to keep the burgers juicy, not so much that you battle leaping flames. 2. Grind (if you can): Part of this is food safety: for all the ghastly ground beef recalls, grinding whole cuts simply avoids this fate. But grinding your own is as much about flavor and freshness. The process is easy, even if you don’t have a grinder or grinder attachment. A food processor can also do the job (preferably one with a sharp blade – look for replacement blades at Amazon if yours is aging). Cut the beef into 1-inch cubes and stick in the freezer for 10 minutes to firm up (so it grinds nicely). If you’re using a grinder or attachment, just pass it through. I prefer one grind so the meat maintains a steak-y quality. If you’re using a food processor, you’ll need a bit more finesse. Add the chilled beef cubes in batches so they fill no more than 1/4 of the work bowl and pulse the beef until it’s coarsely chopped; it should take 10 to 15 pulses to get the meat about the size of little peas. Try packing the “ground” meat – with light force, it should form a patty; or else keep pulsing till it’s pack-able. 3. Handle with care: It may seem trivial, but how you form the patties is important. A good burger should have a loose texture. 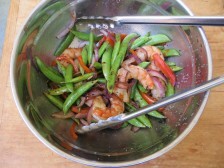 Fat helps – it melts during cooking, like an internal basting brush. But packing the burgers gently ultimately ensures the right texture. To this end, use just enough force to press the meat into a patty and little more. 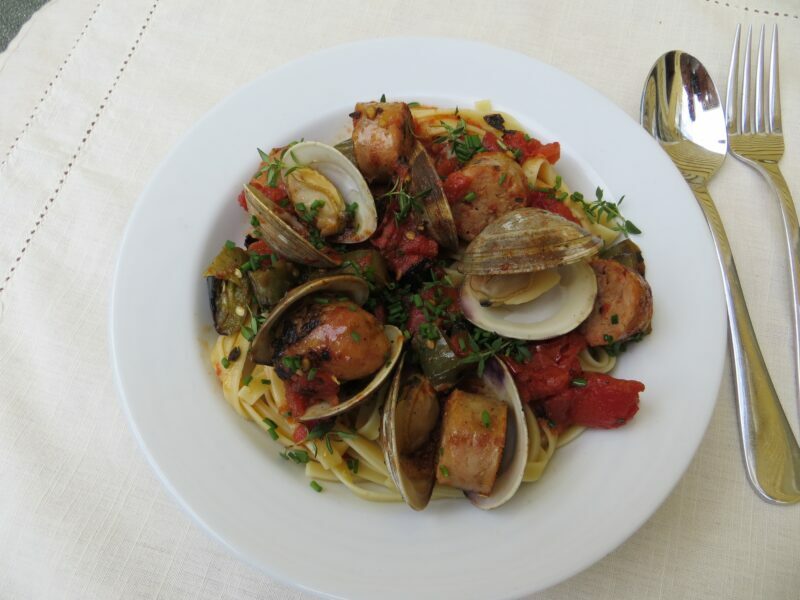 Moisten your hands with a little olive oil, grab a ball (if you’re the exacting type, shoot for 5 oz – 6 oz. ), and pack into a patty between 1/4- and 1/2-inch thick. 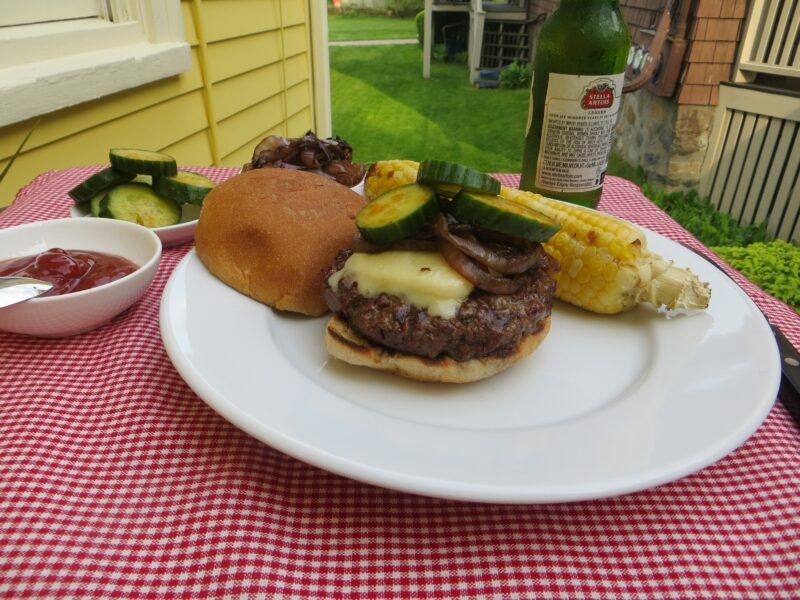 I prefer relatively thin patties; their flat shape increases the surface area so the burgers cook more quickly and evenly and pick up more grilled flavor. Use the heels of your hands to gently flatten the burgers, and your fingers to round the edges. 4. Home-make the toppings: There’s almost nothing in a jar or bottle that you can’t best on your own (with the exception of Heinz 57 which Malcolm Gladwell accurately explains is almost impossible to match). My favorite burger toppings are all simple, but intensely flavored, the kinds of things you can throw together relatively quickly and then store in the fridge until you’re ready to grill. Below are two of my favorites. 5. Cook gently (“slow-grill”): The most common mistake that folks make with burgers is building too hot a fire. You want to cook burgers gently, so they get fine grill marks, but coast to a light pink doneness (or a juicy well done if you’re not sure who actually did the grinding and don’t want to tempt fate). A medium fire (with a surface temp of about 400F) is perfect: you should be able to hold your hand 6 inches above the coals for about 4 to 5 seconds. 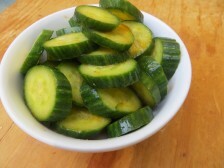 – Spicy Pickle Chips: Toss 1 English cucumber (about 1 lb, thinly sliced) with 1 tsp. kosher salt and 2 tsp. Sriracha and let sit for 10 minutes at room temperature, tossing occasionally. Toss the cucumber with 2 Tbs. white wine vinegar and let sit another 5 minutes before serving; or cover and hold in the refrigerator, mixing occasionally, for up to 3 days. 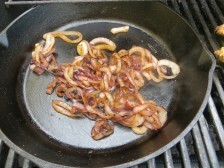 – Charred Balsamic Red Onions: Red onion’s high sugar content causes them to burn before they grill through. 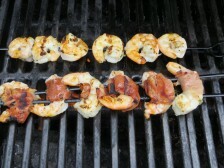 So grill them until they get color and then slowly saute with a splash of balsamic and some water until tender. 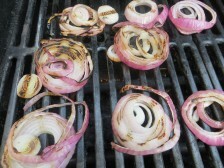 To do this: toss 1 large red onion (about 1 lb., cut in 1/2-inch disks; skewer for easy flips if you like) with 1 Tbs. olive oil and 1/2 tsp. kosher salt. Grill over a medium fire until they get good grill marks on both sides, about 5 minutes total. Transfer to a small saute pan and set over medium heat (or right on the grill). Once the onions start sizzling, add 1 Tbs. balsamic vinegar and 1/4 cup water and cook over medium-low heat, stirring occasionally, until the onions become tender and soft, about 10 minutes; add more water as needed if the onions start to stick or become dry. 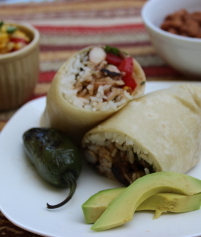 Serve immediately or let cool to room temp and refrigerate for up to 5 days before serving. – Slow-Grilled Burgers: Light up a medium fire. 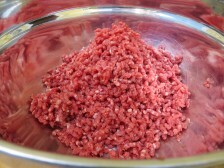 Form 1 1/2 lb ground beef into patties about 1/2-inch thick and 4 1/2 inches wide, gently pressing and spreading the beef while rotating it in your hands. Sprinkle each burger with 1/4 teaspoon kosher salt each on both sides. 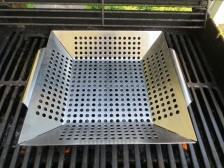 Clean the grill grates well with a wire brush. 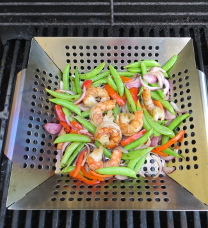 Using an old dish towel, lightly oil the grates (this will prevent sticking and encourage grill marks). Cook the burgers, undisturbed, for about 3 minutes, until their sides start to darken and some juices rise to the top. Flip the burgers, top with thick slices of sharp cheddar cheese (about 5 oz. total), and cook about 3 minutes until the burgers become firm to the touch and the cheese melts. To check doneness, pull one of the thicker burgers to a cooler side of the grill and make a slit in the center; it should be light pink for medium. 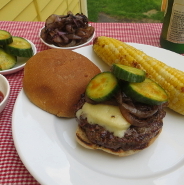 Sprinkle with a little salt, set on hamburger buns and serve immediately with the pickles and grilled onions.